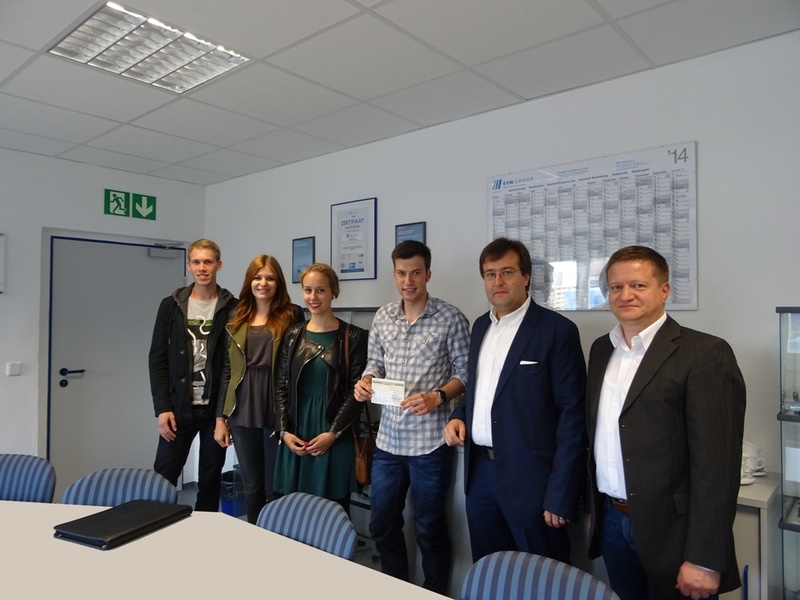 Today, Thursday 26 June 2014, the contribution amount was handed over to the leader of the youth parliament, Mr. Nicolas Schmidt. 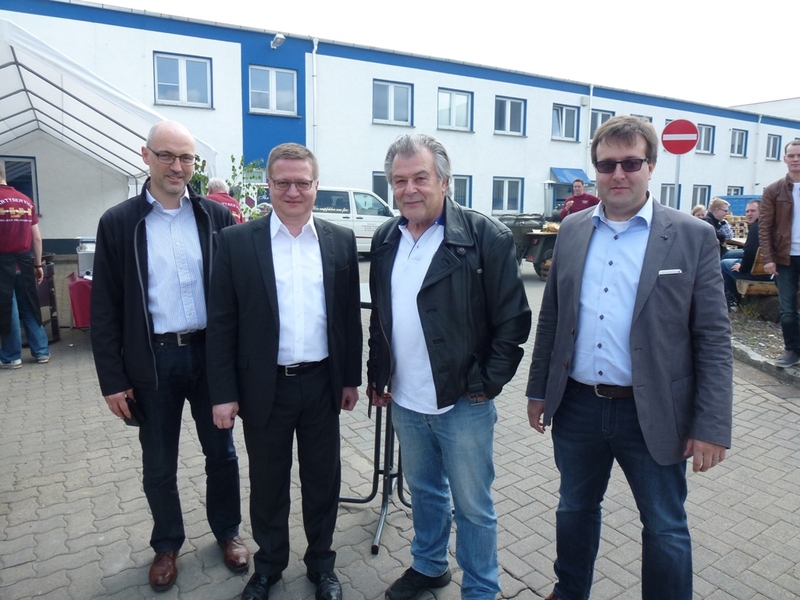 In the course of this handover the management of the youth parliament and the mayor Thomas Spielmann took part with great interest in a tour through the factory. For the 9th time on 12 June 2014 the yearly benefit run Heiligenstadt hast taken place. In this year the proceeds will inure to the benefit of the institution "Ambulant hospice and palliative consulting service Eichsfeld". Besides several single runs about 750, 1500 and 5000 meters, where every participant has shwon his highest stake, also the realy has taken place. In total 44 relays of different companies, clubs and facilities have taken part, also the esw GROUP. Our team has contested together a distance of five times 750 meters and had a lot of fun. This time esw GROUP even has reached the forth position! The management thanks the employees for their stake and congratulates them on the very good result. On Saturday 17 May 2014 we have celebrated our traditional spring festival with our employees, their families and friends in Heiligenstadt. Interested and curious relatives of our employees had the possibility to take part in tours in the production facility and to learn, what has been changed in the factory in the last time. It always brings great interest, to show the workplace and products to the relatives and friends. The managing shareholder of the esw GROUP, Manfred Leitold, opened the festivity together with Maximilian Leitold, member of the management, and the mayor of Heiligenstadt, Thomas Spielmann, and hailed all attendees, amongst them the members of the women's soccer team Uder, which is sponsored by esw GROUP. As a special feature it was announced that every employee could spend one Euro or more for his new advised company shirt. The reason for this was the support of the youth parliament of Heiligenstadt, a concern, for which mayor Thomas Spielmann ist steadily advertising. Afterwards the management of the esw GROUP has rounded the contributed amount to the total sum of 500 Euros. This money will help the youth parliament to organize the summer cinema event in this year. Afterwards the festival went on at nice weather with a lot of food and drinks. A barbecue buffet as well as some cold dishes had been available. In the afternoon people could enjoy an ice-cream, too. There were many surprises for the employees, especially for the children. They had a lot of fun with balloon modeling, make-up for children and soccer games. Carriage rides in the nearer surroundings had been organized. All people could check their strengths at "Hau den Lukas" or taste a "bread on a cane" near the bonfire. A new attraction was the bull-riding facility for the brave ones. Already today we are looking forward to our next spring festival in 2015.